Warmer weather and outdoor fun, springtime makes each of us want to clean up, clear out and start fresh! If you’re getting the bug to do some spring cleaning, these 4 simple tips will help you tackle the areas in your home that need some TLC, leaving it spacious, sparkling and ready for sunshine! Lets face it. No one wakes up in the morning with an uncontrollable urge to window wash. However, the reason most people despise window washing, is because they are doing it incorrectly! Instead of whipping out that paper towel roll, do as the pros do and utilize a squeegee. While it may take a little extra time, doing it the right way will make an otherwise tedious task less frustrating. If there’s anything anyone hates cleaning more than windows, it’s gutters. However, not cleaning your gutters can wreak havoc for your home, causing water and roof damage. In order to clean your gutters this spring, there are several ways to make the process easier. Hose-end attachments make gutter-cleaning far simpler than it used to be, however, if you need to use a ladder, begin cleaning the gutter near a downspout, removing large debris and then flushing alternatively using the hose. If the water doesn’t drain, recheck the downspout strainer and clean as necessary. When cleaning your gutters, be sure to follow safety protocol. Death by gutter-cleaning is not exactly the way any of us wish to go! According to Angie’s List, there are a few spring cleaning tips you should follow when clearing out your yard each year. They include clearing out your flower beds, checking your plants for winter damage and fertilizing. If you’re not sure what would be best to plant within your region, you can find lists of native plants online to ensure your garden is in full bloom this year. Best of all, if you’re looking for some low-maintenance landscaping, there are many different plant species that do well in multiple different environments, with little to no care. A relief to those who want their home looking great but just don’t have the green thumb to do it! Clearing out space within your home is just as important as fixing up the outside. In order to clean up, focus on one area of your home at a time, using the keep, donate, discard principle. If something has a genuine plan or purpose, find a location for it within your home or place it within a storage unit for safe keeping. If you don’t have a real purpose for an item, but believe someone else can benefit from it, donate it to your local Goodwill. And if you don’t have use for it and no one else will? Toss it honey-bunny, and don’t look back! Best of all, by maximizing space using storage and donating, you will be able to get your home deep-cleaned following an easy to use cleaning checklist. Who knew your home could be so clean and shiny? 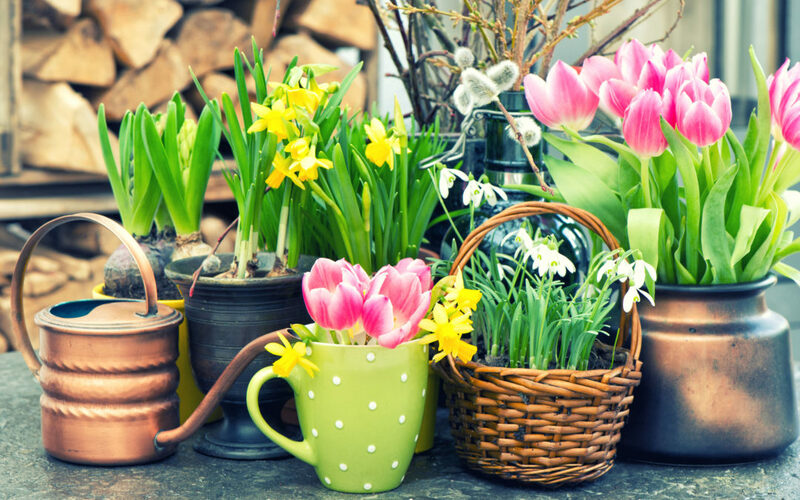 To a happy, clean and clutter-free spring!